Exactly three months from today we will be in New York City boarding a plane for an epic four month journey to Namibia and Southern Africa. Lots of internet research going on during our (very little!) spare time here at the cabin! You'll have noticed that link above that brings you to another facebook contest that we entered. Just an update that we are now in the top three of that contest to win 25 nights of free accommodation (with breakfast!) in Namibia. 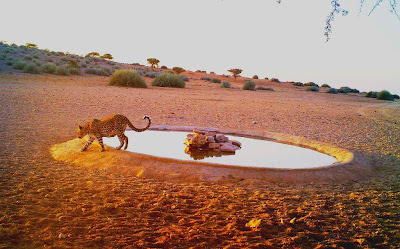 This accommodation is being supplied by the Gondwana Collection Namibia who operate a series of lodges, campgrounds, and cottages across Namibia. We will be camping here!! In fact, our three and a half week camping trip that is being organized by ATI Holidays already has us booked in at a few of the Gondwana campgrounds so we're looking forward to telling you about them. But we would really love to also tell you about all of their lodges. So, when we finish our camping trip and if we can finish the contest in the top three, we will be making an effort to visit as many of the lodges as possible to experience everything Gondwana Collection has to offer. You can help us out by visiting the link and voting 5 stars every day for the picture titled "Flower Power". In doing the research as to how we're going to get around...it turns out that Namibia and especially South Africa have a very good long distance bus service. And, not a bad rail system with very inexpensive passenger service! Who would have thought?? The buses are actually a little pricey, but the train seems very cheap. So, this may be another worthwhile transportation option if buying and selling a used car proves to be difficult. It's almost looking like the country of Botswana is dropping off our radar. We want to spend as much time in Namibia as possible. And Botswana seems much more geared to doing self drive camping. It looks like we will be able to get around much of South Africa by train, and there really is a lot to see there. You all know how we like to get ourselves immersed in a region to really experience it, so two months in Namibia followed by two months in South Africa may just fit the bill. Plus, our return flight leaves from the city of Johannesburg, South Africa so the logistics will work out as well. That's one well manicured watering hole that leopard is patronizing! Can't wait to see all your wildlife pix. I think some of these lodges and campgrounds we will be staying at will be quite manicured as well. Seeing pictures like this is making us very excited and we can't wait to show you everything that we see. Thanks so much for all your help Donna and Sam's, we really appreciate it. Getting closer! Can't wait to see the pics. How do you find all these amazing contests?? Hats off to you. I wish there were some way other than facebook to help you. I wish there was too Sherry but thank you for just wanting to help us out. Kevin finds them on the internet. This latest was actually advertised on the Namibia Tourism Facebook page. After this one though, I don't think we will be doing anymore voting type of contests, they are hard to keep up and we don't like to feel like we are bugging people. Train/Bus route does the Garden Route which is possibly the nieces area in ZA as it follows the India Ocean coast. Regardless, we will wait to here about Namibia part of the trip as we have it on our Bucket list. Hi Tommy, thanks for taking time to comment. We haven't really started our serious planning for South Africa yet, we are still working on Namibia. I googled the Garden Route and it does sound wonderful and right up our alley, there just seem to be so many choices of fantastic places to see, we will definitely try to fit this into our planning. We will keep everyone up to date on our progress as we get closer and if you or anyone else out there has any suggestions please don't hesitate to let us know about them. B-17 Bomber flies into town! Would you go to Cuba? We're going to have visitors! We're ready to order our Tilley hats! Finally, some peace and quiet. A facebook milestone for us! Help us choose the best hat! What to do with the little blue car? We're going to Cancun, Mexico! Here's our Harvest Hosts contest winners! Stung by a wasp, and dog sitting!